Aspartame is an artificial sweetener. It’s roughly 200 times as sweet as sugar and doesn’t have the bitter aftertaste of stevia. [1, 24] That’s why you need 200 times less aspartame to give a food or drink the same sweetness. So you’re consuming 200 times fewer calories. Aspartame is basically calorie-free. Aspartame doesn’t affect your appetite, glucose or insulin levels and can thus easily save you lots of calories in your diet and result in relatively easy weight loss [16, 17, 25, 26, 27]. Aspartame isn’t very heat stable though, so you can’t add it to anything before you bake or cook it. It’ll lose its sweetness. So you have to add it to cold products or after heating them before you consume them. Still, pretty sweet, huh? It would be, if aspartame were safe. Is aspartame safe? What happens to aspartame in your body? Aspartame is indeed an artificial sweetener, food additive E951 (E-number). This chemical sounding classification frightens many people, but this fear is rooted in ignorance. Fear of the unknown is a basic principle of human psychology. There are about 1500 other E-numbers, of which hundreds are artificial. Ironically, the E-number is in fact a certificate of safety. It means the European Union has decided a food additive is safe for human consumption. Take-home message: Aspartame is broken down into harmless substances that are found in much higher concentrations in many whole foods. Of course, just because all these authorities say aspartame is safe up to at least the ADI doesn’t make it so. Let’s look at the scientific research directly. In humans, the Acceptable Daily Intake has no relation to getting cancer, digestive problems, diabetes, artery or heart disease, or premature birth. [7, 8] That’s the conclusion of a team of 5 international experts who were invited by the scientific journal Food and Chemical Toxicology to determine the safety of aspartame. If you’re skeptical about the researchers’ motives, this research was sponsored by the Italian Association for Cancer Research and published in October 2013. Multiple other research reviews have analyzed literally hundreds of studies with more than 1,000 participants in total. These all came to the same conclusion: aspartame consumption below the Acceptable Daily Intake is safe. [9, 10, 23, 28] And again, this includes cancer. A multitude of studies in humans, including one with half a million participants, supports that there is no consistent relation between aspartame consumption and any type of cancer. However, it may be noted that there is one study on isolated human cells (in vitro) and one on mice where signs of toxicity were found at 32-34 mg/kg/d . There is no evidence showing adverse effects of these intakes in controlled human research, but if you want to err on the side of very high safety, 30 mg/kg/d may be a prudent upper limit. Given the highly positive safety record of aspartame and the well-documented health risks of excess sugar intake and obesity, for the average Western individual to avoid aspartame is quite ironic. 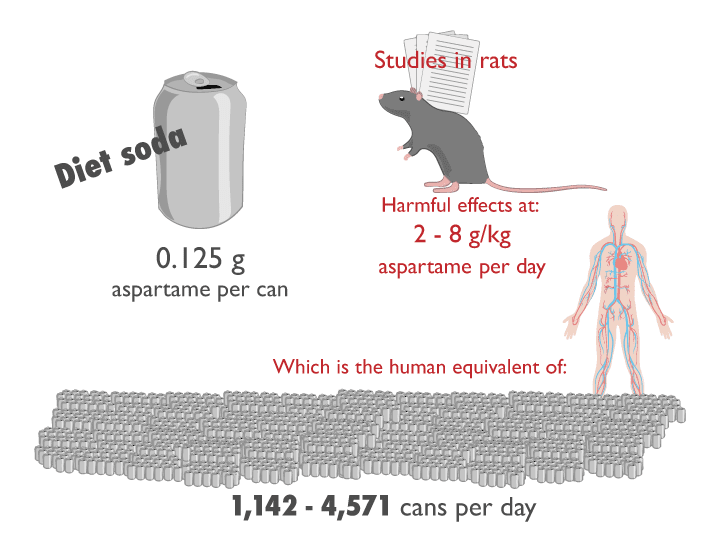 Take-home message: A multitude of studies from a multitude of health organizations consistently find aspartame is safe to consume up to the Acceptable Daily Intake of 40-50 mg/kg/d, the equivalent of drinking well over a dozen cans of diet soda every day. This intake includes a factor-100 safety margin. Can you be aspartame sensitive? Some people claim that no matter what the science says, they can directly feel adverse reactions to aspartame when they consume it. They may get a headache or nausea after drinking diet soda with aspartame. So maybe some people are intolerant to aspartame, even though the majority of people can consume it safely? A team of researchers put this idea to the test. They got a group of self-proclaimed aspartame-sensitive people and compared them to a control group of people without any idea about whether they reacted to aspartame or not. Then they told the subjects they would receive aspartame twice, while in reality one time they were given a placebo once and actual aspartame the other time. The self-proclaimed aspartame-sensitive subjects indeed reacted adversely to the aspartame. However, they also reacted just as adversely to the placebo. There were no significant differences between the placebo and aspartame consumption for any symptom. The researchers took urine and blood samples to study the biochemistry and metabolism of aspartame consumption. 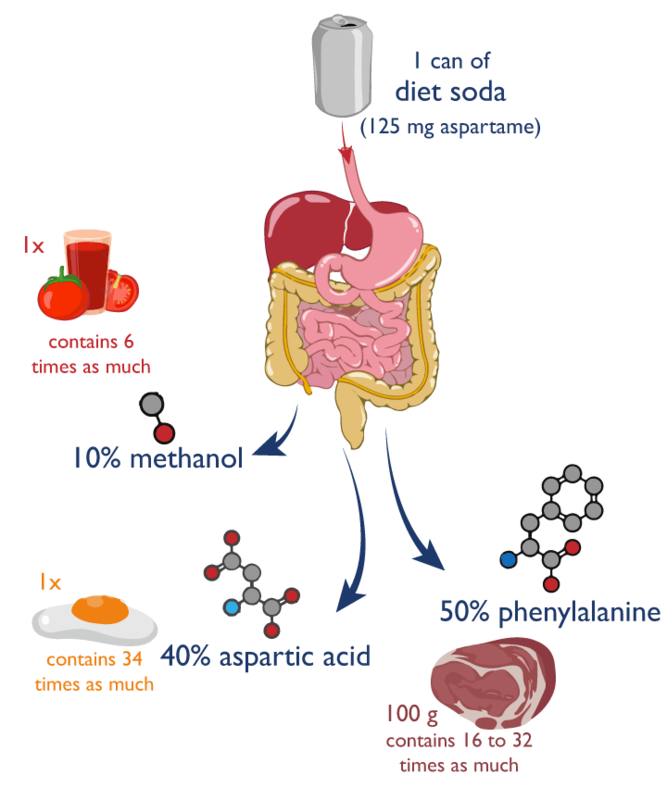 The aspartame-sensitive group had perfectly normal aspartame metabolism. In other words, the symptoms were a pure nocebo effect: people that think they’re aspartame sensitive just react psychologically to the idea of consuming aspartame regardless of whether they’re actually consuming aspartame. The symptoms are in their head, self-inflicted. The researchers also unleashed a battery of psychological tests on the participants. The ‘aspartame-sensitive’ individuals had significantly higher sensitivity to stress and differed from the norm in several psychological realms, including how they reacted to their feelings. So if you get any weird symptoms after consuming aspartame, it may be wise to check if you’re not just paranoid about aspartame and you’re making life needlessly hard on yourself and subconsciously self-inducing the symptoms. Reading this article should be a helpful first step in correcting your mindset. Oh and if you think you can taste whether something was flavored with aspartame, in this study the participants couldn’t. Of course certain sugar-free or light products may still differ in flavor from their sugary counterparts. Take-home message: If you get acute symptoms after consuming aspartame, that is probably a nocebo effect. You may be so averse to the idea of consuming aspartame that your brain induces its own symptoms. Many people think that people who watch the news are more informed than those who don’t. The news typically centers on crime. So you’d expect people who watch the news to be more informed about crime in particular. In reality, people who watch the news are worse at predicting crime rates than those who don’t: they overestimate the occurrence of crime because the media only shows the bad. [12, 13, 14] The media’s job is to get your attention. If you want an objective perspective about something, you come to science, not Fox News. 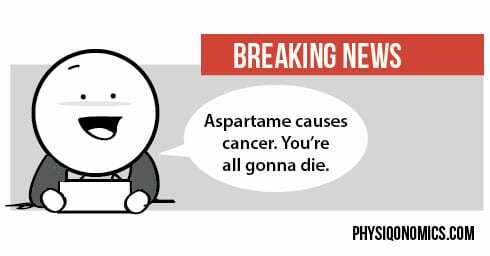 And the science overwhelmingly supports that aspartame is safe to consume up to pretty preposterous levels. Take-home message: The media profit from spreading fear and controversy, not the truth. 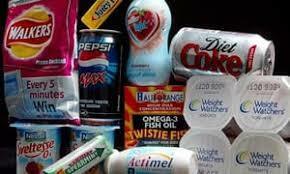 As a result, people that watch the news tend to have a distorted view of crime and aspartame’s safety. Trust in science, not the news. When something sounds too good to be true, it’s often false. 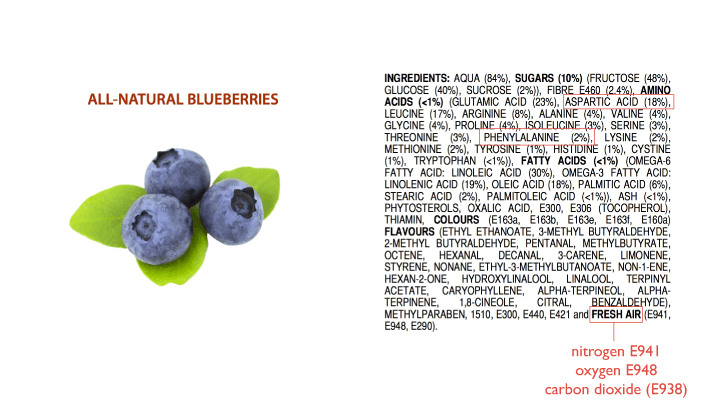 A substance that makes something as sweet as sugar without calories certainly sounds too good to be true. Moreover, people tend to view ‘tasty’ and ‘healthy’ as opposites. Our society makes us believe dieting always goes hand in hand with suffering. Still, aspartame is the most popular sweetener in the world. For good reason. Its safety record is impressive. The hundreds of thousands of people who have consumed aspartame in clinical research remained healthy while making their diets tastier. Thanks to the wonders of modern technology, we can now sweeten our food without the calories of sugar. Sometimes you can have your protein cake and sweeten it too. Enjoy it! Interested in science-backed information about everything you need to know for optimal health and fitness? Our online PT Course has you covered.